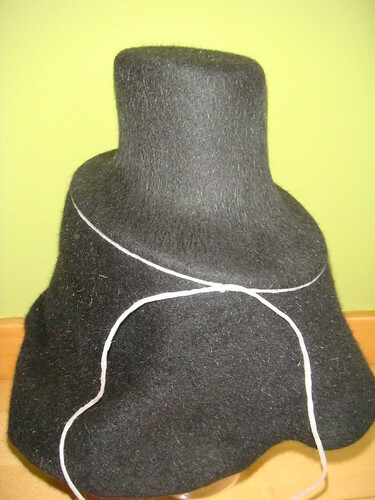 For those who cannot wait until the hat is finished and want to know how the blocking of the Mini Hat is going, here is a sneak preview of the hat block in use. 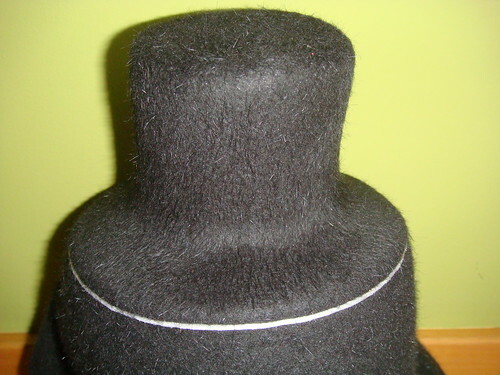 I have used a black furfelt cone with spikes, and as you can see there is a lot left over after blocking it. I’ve started by spraying water based sizing on the cone, wrapping it up in a wet cloth and microwaving it for 1,5 minutes to soften the felt and get the sizing to sink in. I’ve manually stretched the tip a little bit and then I’ve started blocking. Around the collar there was a lot of excess felt, which I’ve managed to reduce by ironing with a wet cloth, pushing down (but not too much), all in an effort to encourage the felt to shrink in that area. It has taken some time but it has worked! And here is a picture from an angle. As you can see I did not need to use any pins, the string that locked on the groove was enough to keep the felt in place. I do not know what I will do with the edge when I unblock it. I think that for a folded edge I should have made the groove lower down, so possibly the only option will be to cut the edge. Very cool and nice hat. Can’t wait for the final product! Fantastic! I LOVE! The fur cone is perfect for your block. It’s so lush. Great shape! Some terminology differences here–by ‘collar’ do you mean what would be (if not so small) the headsize opening? I’ve always had a very hard time getting felt to shrink that much so the key for you was actually ironing it and using the heat/steam to shrink it and futher the felting process? Very cool! You’re right, I’m talking about the headsize opening, but it seemed absoluely silly to name it that when the “headsize” in this case is so tiny. I also had my doubts on whether it would be possible to block something so small, and I was happy to see it was possible. The thing is not so much to pull down on the felt, which would thin it down too much but, like you rightly understood, to encourage it to shrink down, furthering the felting process. I have a round iron that I heat on the stove that works beautifully for this purpose (with a wet cloth in between, otherwise I would have scorched the felt). Finally, just say that using fur felt makes all the difference in this case. I would not bother to attempt this with a wool felt, although if someone tries and makes it work I would be happy to know. I would enjoy seeing other people’s attempt at this (blocking small shapes, or making cork blocks), share your links with us in a comment! Wow – absolutely stunning block – you are so clever, I would never have believed that the pile of cork layers would turn into such a beautiful block. And the hat is gorgeous. 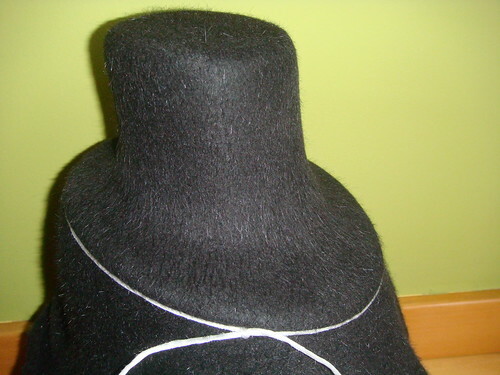 I am struggling with blocking a small hat at the moment – I understand what you are saying – its not easy at all. You are an inspiration Cristina. ¡¡FELICIDADES CRISTINA¡¡. He seguido todo el laborioso trabajo de la realizacion de tu sombrero y eres una artista. Me encanta la calidad de demuestras . El resultado final tiene una linea sencilla y elegante.